Soybean farmers, whose crop represents 41 percent of the value of products on China's tariff list, will feel the full effect of the escalating trade war between U.S. President Donald J. Trump and the government of the People's Republic of China. On July 5, President Donald Trump announced the resignation of Scott Pruitt, the embattled administrator of the U.S. EPA. Deputy Administrator Andrew Wheeler is set to assume the role of acting administrator of the EPA on July 9. The U.S. EPA has announced it will hold a public hearing in Ypsilanti, Michigan, July 18 to gather public input on its proposed rule to set 2019 RVOs under the Renewable Fuel Standard, along with the 2020 RVO for biomass-based diesel. On June 29, the U.S. EPA released its second report to Congress on the environmental and resource conservation impacts of the RFS program, as required by the Energy Independence and Security Act. Biofuel representatives criticized the report. On June 28, the U.S. Senate passed its version of the 2018 Farm Bill with a strong bipartisan 86-11 vote. The legislation, titled The Agricultural Improvement Act of 2018, includes mandatory funding for Energy Title programs. 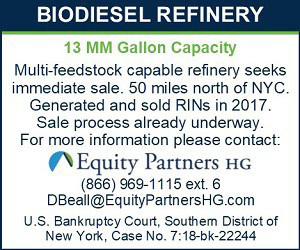 Bridgeport Biodiesel 2 LLC, a fully permitted, commercial-scale biodiesel refinery with a capacity of 13 MMgy, has retained Equity Partners HG to find an investor or buyer for the company. The plant is just 50 miles north of New York City. As can be seen from the approval list published jointly by AGQM, UFOP and the Association of the German Biofuel Industry (VDB), heavy-duty road traffic can use increasing quantities of biodiesel in the future, including B20, B30 and B100.